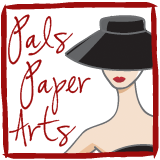 I hope you are ready to play along with the Design Team at Pals Paper Arts! Tune in tomorrow for our *sketch* challenge! In the mean time, if you need any Stampin' Up! products, please use my website to order. If you have any questions, I can answer, please email me directly. I'm happy to assist you. This is going to be cute! I love the "hip" color combination!